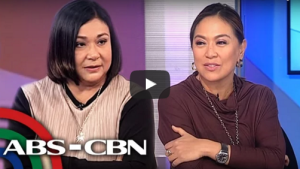 BATANGAS – Aspiring senator Alma Moreno on Sunday said she is determined to run for public office despite being ridiculed over an interview with Karen Davila on ANC last week. Touring Balayan, Batangas with Vice President Jejomar Binay, Moreno had been initially reluctant to answer questions from the media. “Huwag muna ngayon. Darating ang araw na magpapa-interview ako. Hayaan na muna ang bashers,” she said. The sight of supporters at the town market, however, emboldened Moreno in reiterating her qualifications as a public servant. “Ako po si Alma Moreno. May pinagdaraanan po. Siguro naman napanood nyo sa TV. Pero lumalaban pa rin. Hindi man ako ganoon kagaling magsalita, may puso naman ako sa tao,” she declared. In the interview, Davila asked Moreno if she supports the Reproductive Health (RH) Law. “Yes in all forms or yes with reservations?” Davila then asked. “Then, what are your reservations?” Davila asked. “Kailangan pa bang sagutin?” Moreno asked. “Of course, you are running for the Senate.” Davila replied. Do you mind if I quote a few of your posts as long as I provide credit and sources back to your weblog? My blog site is in the very same niche as yours and my users would really benefit from a lot of the information you present here. Please let me know if this alright with you. Regards! It’s not my first time to visit this website, i am visiting this website dailly and obtain pleasant facts from here all the time. Hi there it’s me Fiona, I am also visiting this site on a regular basis, this site is in fact good and the people are really sharing pleasant thoughts. It is the happiest time of my life so far, when I am watching these} funny movies here, since after whole day working I was so tired and now feeling fine. I like to work on PHP rather than .NET, even if .NET provides the feature of drag and drop elements, except I like PHP greatly. When someone writes an post he/she retains the plan of a user in his/her mind that how a user can understand it. So that’s why this post is outstdanding. Thanks! I just want to tell you that I am just newbie to weblog and seriously liked this blog site. Almost certainly I’m planning to bookmark your blog post . You surely come with wonderful stories. Thanks a bunch for sharing your website. I just want to tell you that I’m very new to blogging and site-building and definitely liked your blog. Almost certainly I’m planning to bookmark your website . You surely have terrific writings. Bless you for revealing your web site. I just want to say I am just new to blogging and really liked this blog site. Very likely I’m going to bookmark your website . You amazingly come with superb posts. Regards for revealing your website page. Thank you so much for giving everyone a very nice opportunity to read in detail from this web site. It’s always very pleasant plus packed with a great time for me personally and my office colleagues to search your web site the equivalent of thrice in 7 days to read through the latest items you have got. Of course, I am just usually contented considering the effective hints you serve. Certain 2 points in this article are in truth the most impressive we’ve had. I not to mention my pals came going through the excellent items from your website and so all of the sudden came up with a terrible suspicion I had not thanked you for them. Those men are already for that reason happy to read them and have now absolutely been using them. Appreciation for turning out to be so thoughtful as well as for picking this sort of useful issues most people are really wanting to be aware of. My very own sincere apologies for not saying thanks to you earlier. A lot of thanks for all of your efforts on this website. Betty really likes getting into investigations and it’s really easy to see why. A lot of people notice all of the powerful method you produce great thoughts via the web blog and encourage contribution from other individuals on this point then our girl is undoubtedly discovering a whole lot. Take pleasure in the remaining portion of the year. You are doing a tremendous job. Needed to draft you one very small observation to finally give thanks yet again about the extraordinary solutions you have discussed on this page. It was really particularly open-handed of you to present unhampered all that a few people could have made available as an e book to end up making some bucks for their own end, notably now that you might well have tried it if you ever decided. The suggestions likewise acted to be a great way to know that most people have the same fervor really like my personal own to grasp very much more on the subject of this issue. I think there are several more enjoyable times up front for people who start reading your site.